I’ve been blogging 5 years and can count on one hand the number of lime recipes I have. And that includes squirting some lime over avocado. Time to branch out and make a classic. 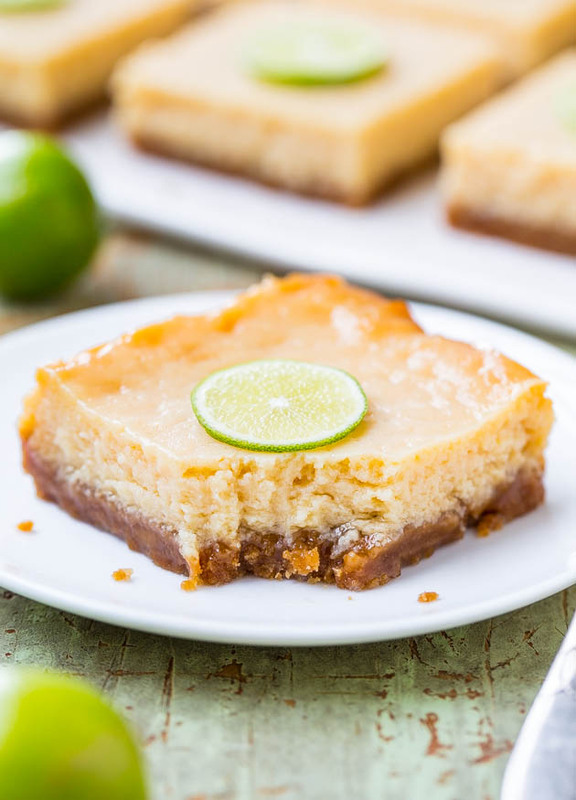 Except rather than making classic Key lime pie I made Key lime pie bars. I’ll always take bars over pie since making pie crust is never on my to-do list, and this is a one bowl, no-mixer recipe. 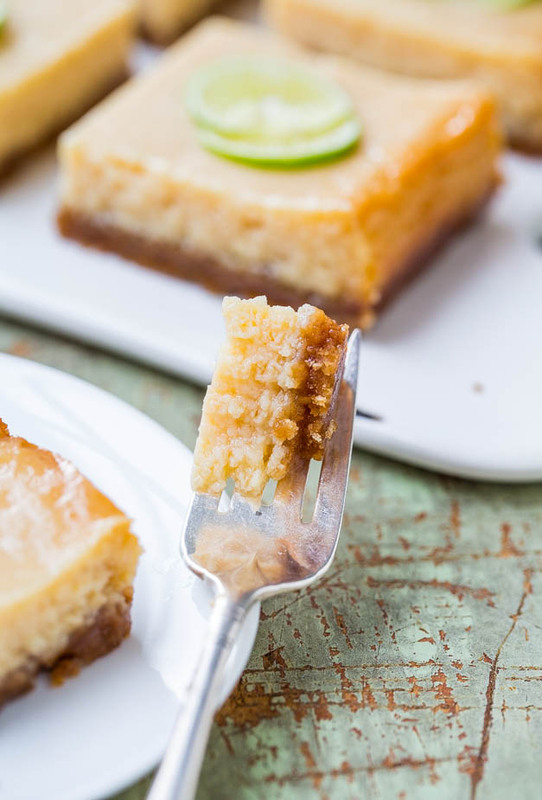 Just like my Lemon Bars, there’s nothing lackluster about how much robust lime flavor is present. The filling is tart and bold without being overpowering. 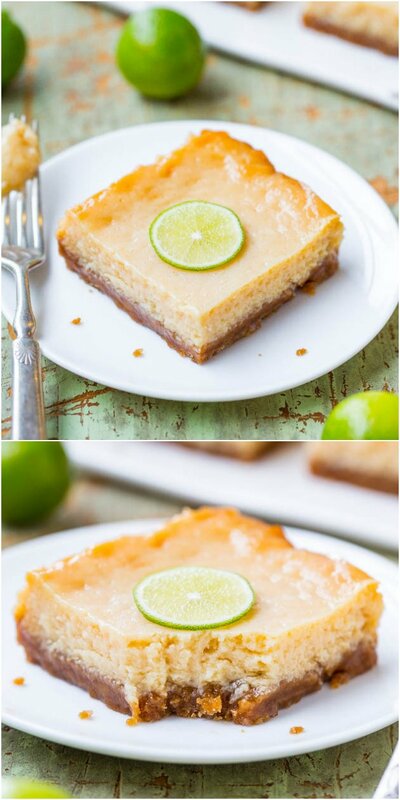 While baking the butter and brown sugar in the crust caramelize, and it plays perfectly off the lime. 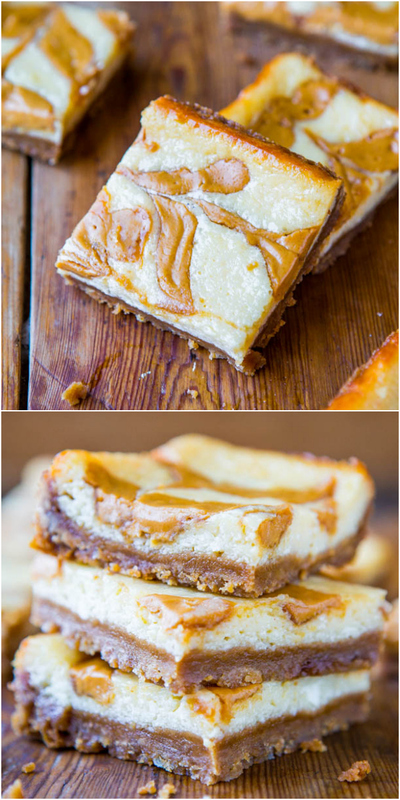 It’s the same crust I used in Peanut Butter Swirled Cheesecake Bars, Salted Caramel Apple Cheesecake Bars, and Salted Caramel Pumpkin Cheesecake Bars. It seriously makes the bars. It’s a keeper, even for someone who doesn’t like crust. 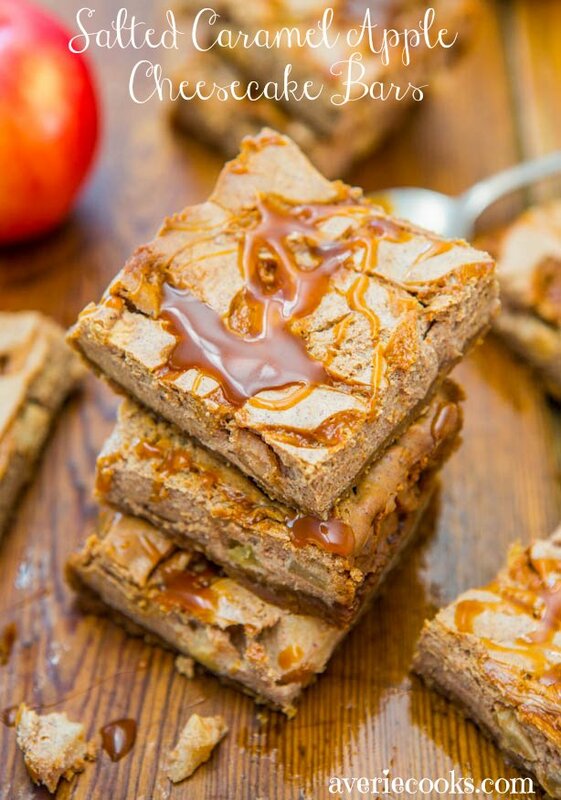 It’s got just enough crispiness and crunch, yet there’s slight chewiness, and it holds together without crumbling, something that graham cracker crusts don’t always do. For the filling, I used actual Key limes. They’re smaller ping-pong sized limes, about half the size of average limes. They’re typically grown in the Florida Keys, hence the name. I found a bag of about 25 for $2.49 at my regular grocery store and literally needed almost all of them to get 1/2 cup lime juice. If you can’t find Key limes, just use regular limes or I’m sure bottled lime juice will be just fine. I’m wishing I had gone either of those routes because juicing all of those mini limes wasn’t what I had bargained for. The filling is simply lime juice, sweetened condensed milk, 1 egg, sour cream (I used lite), and sugar. 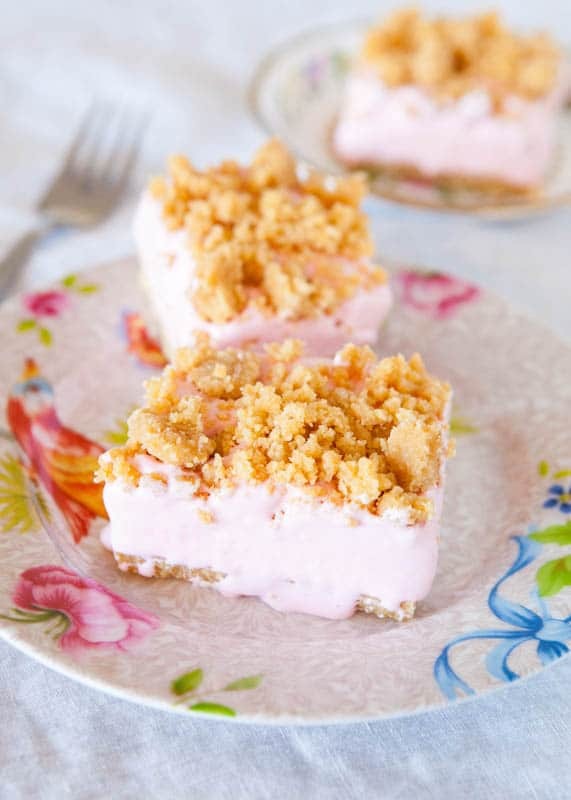 Because I didn’t want the bars to resemble cheesecake, I avoided using any cream cheese and instead used sour cream to lend richness and creaminess. After whisking together the filling and tasting it, I thought it was a little bitter. 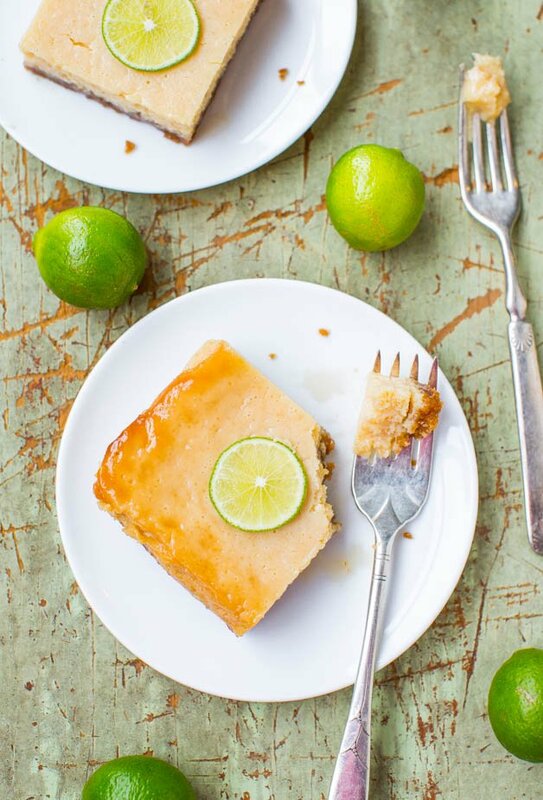 Taste your mixture, and because all limes and palettes vary, add sugar if necessary. Baking times will vary based on oven and climate variance, the type of sour cream used (lite makes batter runnier thus taking longer to bake), and if sugar was added (makes batter runnier). The center should be set and not too jiggly. Always watch your bars, and not the clock. Bake until done. After removing the pan from the oven, the bars looked like a beating heart was pulsing under the surface for over 2 minutes. It was like watching on a science experiment on the cooling rack. It should go without saying, but you must allow them to cool for at least a couple hours at room temp, cover them, and refrigerate until chilled. I cannot imagine eating warm Key lime pie. It’s an easy dessert to make a few days before an event and just keep parked in the fridge until you need it. The bars remind me of warm weather, ocean breezes, and I want to blast some Margaritaville. And make one, too. To wash down the bars with. 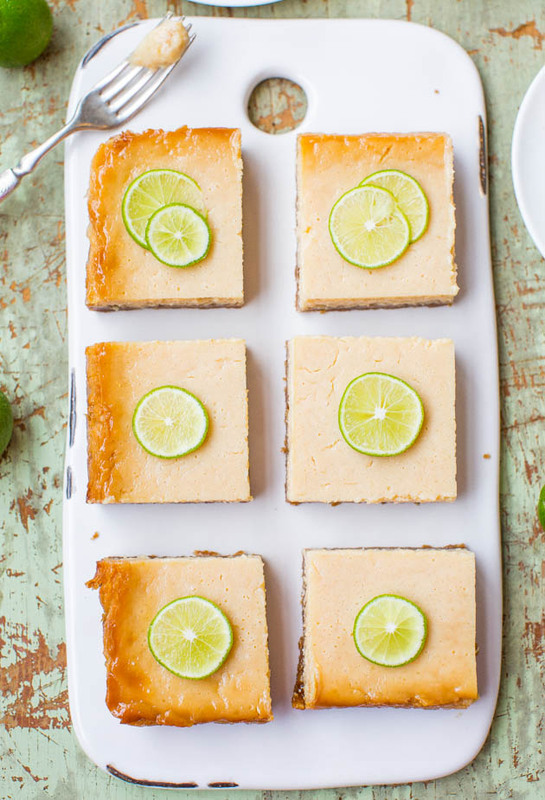 These easy, one-bowl, no-mixer bars are full of robust lime flavor. The filling is tart and bold without being overpowering. 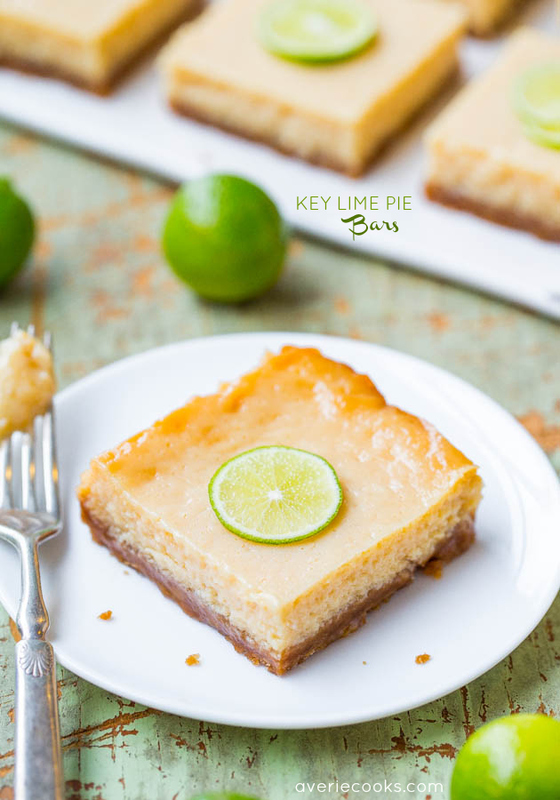 While baking, the butter and brown sugar in the crust caramelize, it plays perfectly off the lime, and the crust really makes the bars. It’s got just enough crispiness and crunch, yet there’s slight chewiness, and it holds together without crumbling. I used freshly squeezed Key limes, but if you can’t find them, substitute with regular limes, but bottled lime juice will likely be fine. 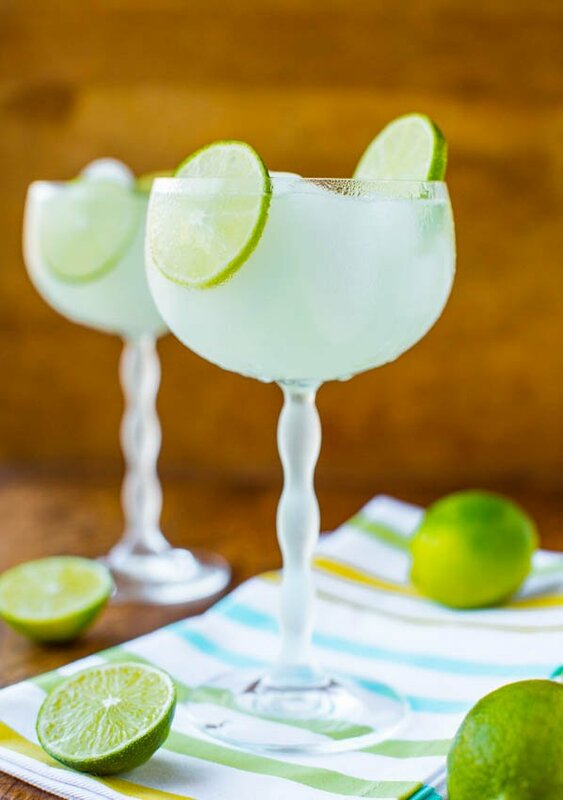 Make sure the Key limes are not too hard or too green, or they’ll be bitter. Mine were and I needed to add sugar; taste your filling before adding it. Bake until bars are set in the middle. Slight jiggling is fine, but not sloshing. Bars will be bubbling vigorously so use caution when removing them from the oven and allow to cool at room temp before chilling in the fridge. Crust – In a large microwave-safe bowl, melt the butter, about 1 minute on high power. Turn loose crumbs out into prepared pan and using a spatula, pack mixture firmly into pan in an even, smooth, flat layer. Bake for 10 minutes. While crust bakes, prepare the filling. Filling – Combine first 4 ingredients in a large mixing bowl (same one used for crust is fine), and whisk until smooth and combined. Taste filling. If it’s bitter or too tart, add sugar as necessary, to taste. I used 1/2 cup sugar because my Key limes were a bit bitter. After 10 minutes, remove crust from oven and pour filling over it, smoothing the top lightly with a spatula. Return pan to oven and bake for about 45 minutes, or until center is set with only some slight jiggle; some looseness is okay, but there should not be sloshing in the center. You’ll notice the filling near the edges start setting up first; remove pan from oven when center starts to take on the same appearance as the edges. Don’t let the bars get ‘browned’, they should stay fairly pale and light. Bars firm up more as they cool. Bars will be bubbling vigorously so use caution when removing them from the oven. Allow bars to cool in pan on a wire rack for about 2 hours. Cover pan with foil (to prevent fridge smells), and refrigerate for at least 2 hours, or overnight, or until well chilled before slicing and serving. Optionally, garnish with thinly sliced limes before serving. Bars will keep airtight in the refrigerator for up to 1 week. 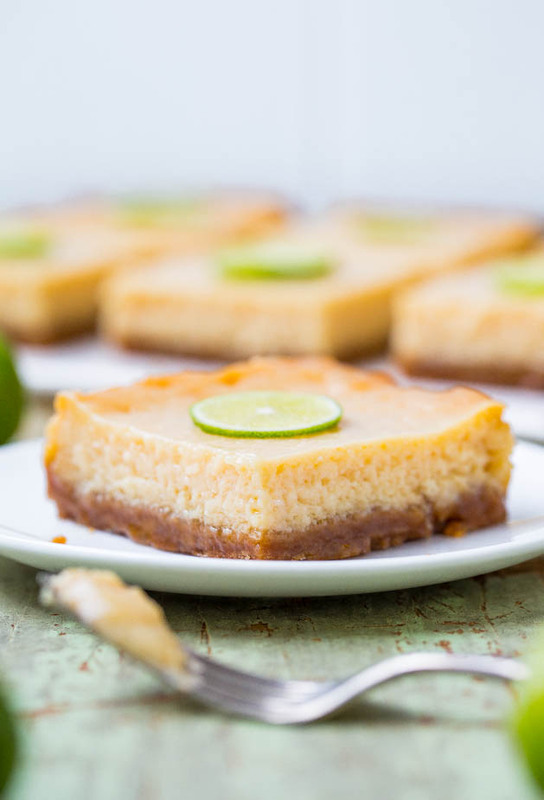 Made these with some limes from my backyard – OMG. 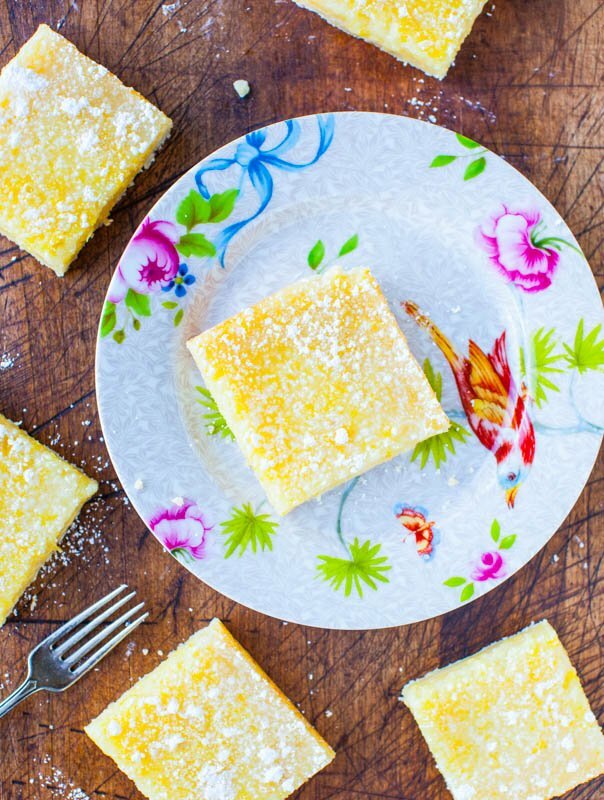 As if I wasn’t already obsessed with the lemon bars on your site, these are also to die for. Usually I share my desserts with family and friends, but this time, I was greedy. As always, your recipe was easy to follow and a yummy outcome! I love that you were greedy :) Every once in awhile I’ll be like that hoard the whole thing for myself pretty much! This recipe looks good! 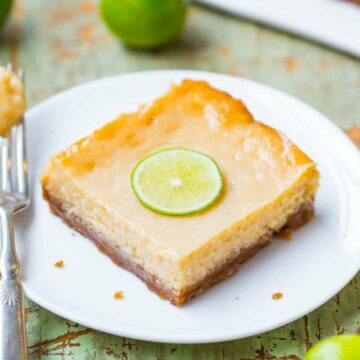 Can I substitute the lime juice for lemon juice to make lemon bars and double the recipe to bake in a 9×13 pan? How long would you recommend baking it for a 9×13 pan? Thank you! 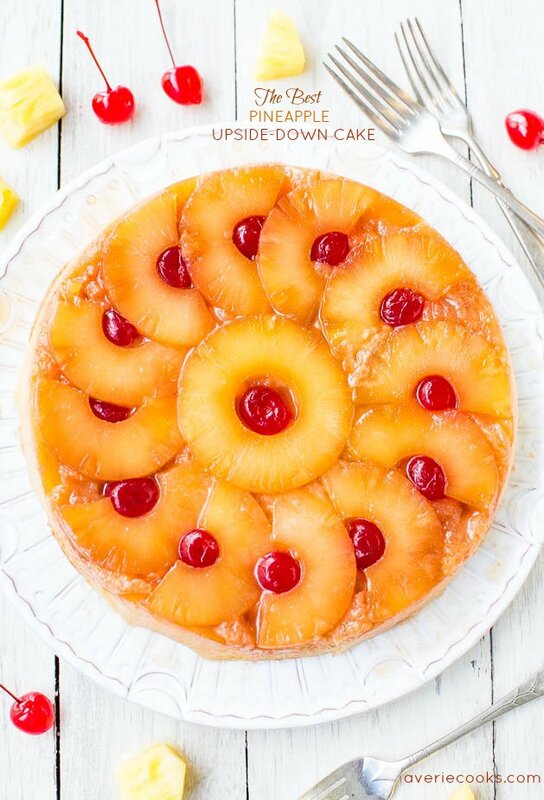 Thank you, but how long would you recommend baking this if it were doubled in a 9×13 pan? I really don’t know since I haven’t done it. Watch it and use your best judgment.